As the end of the school year is approaching all fashion academies are presenting their graduation collections. Yesterday it was the Willem De Kooning Academy in Rotterdam who showed us the work of their graduation students. The Schiecentrale was their show area, a good choice, cause it all felt very professional. After a few second and third year students showed off their designing skills, it was time to shine for thirteen fourth year students. One thing that struck us was the great choice of colors. The students, independently of each other chose the most oustanding colors. Many shades that are in fashion now, like camel, peach, lilac and turquoise, were mixed & matched into wonderful eye-catching outfits. 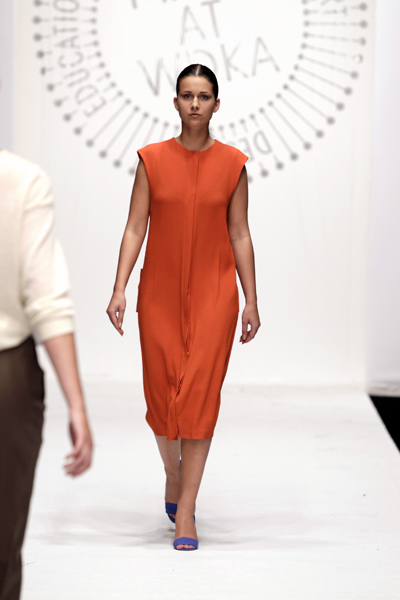 The show started off with several design by Evalien van Gemeren, named Eva. 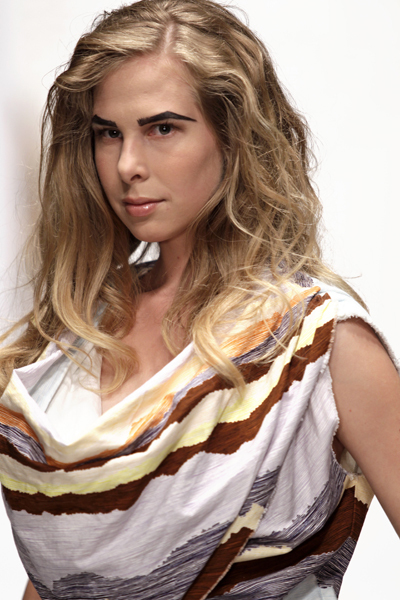 She came up with colorful prints, which she called self-developed hieroglyphs. Overall her designs had a quite wide silhouette and came across as a bit manly. 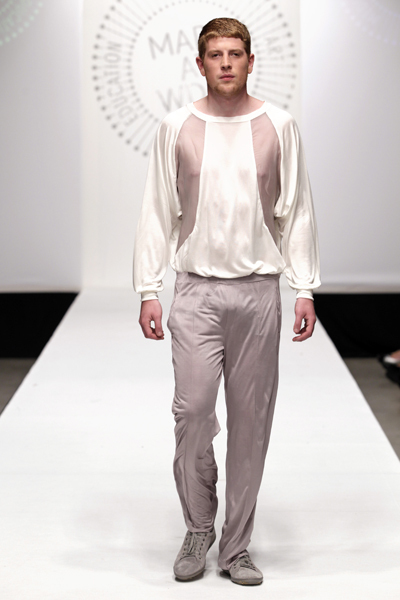 Musa Shah presented a men’s collection, called Connected intimacy. 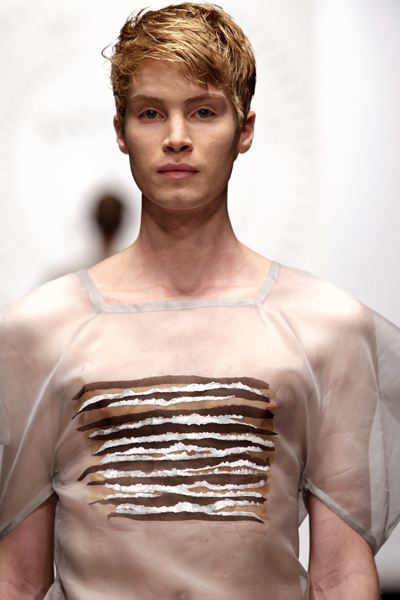 Although…manly….. His fabrics were thin, transparent and shiny and thus gave the outfits a very soft touch. Some people will love it and some will hate it. But the truth is, Musa’s clothes were all very well made. One of the collections that would probably sell very well was that of Ruby Verhoeven. She presented a classical and very wearable collection. Ruby played with the details of her clothes, like the pockets and zippers. They all appeared to be something different than what they looked like. Her fabrics were thin and feminine and the colors of the designs looked great together, especially with the blue shoes the models wore. 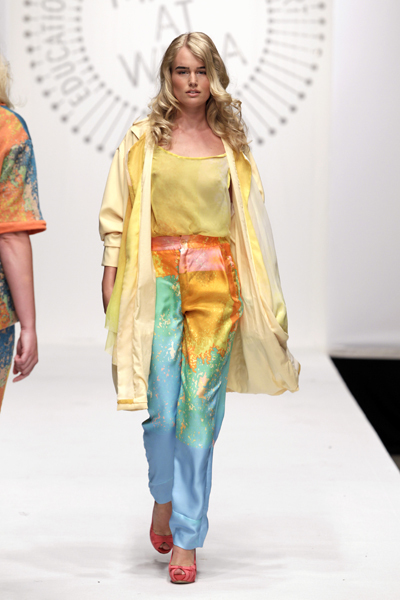 The collection of Anke de Vor, named TriBe, showed – again – a wonderful color palette. Peach, lilac and terracotta for example. Anke used a great print and also mixed jute with cotton for her imagine tribe. The clothes were based on those of neo-hippies. 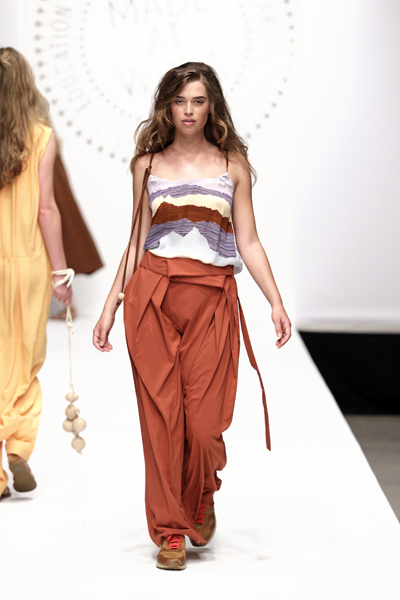 And for one of the designs (a peach-colored mix between a jumpsuit and harem pants) we sure could tell comfort and movement were important aspects in this collection. 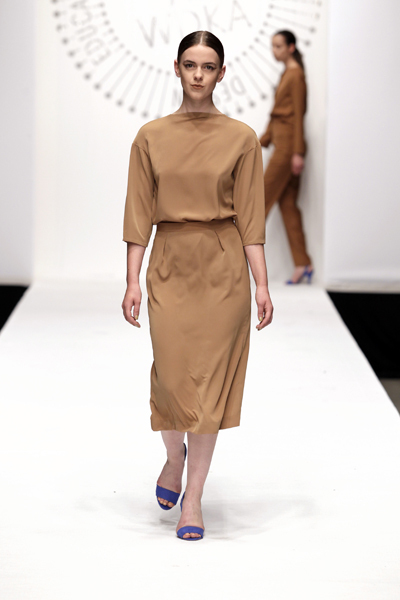 Noortje Zijlstra’s collection caught our attention, while it was remarkable, yet not very wearable. 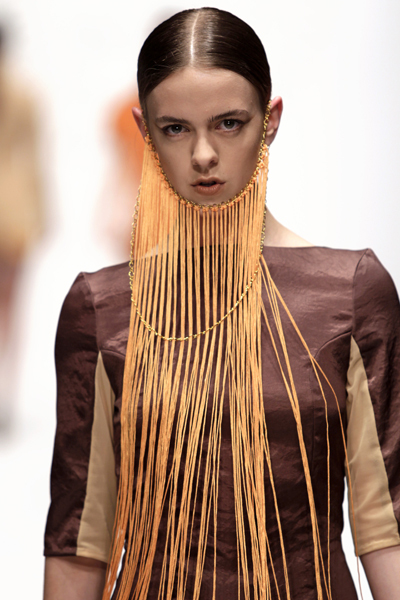 The serie of dresses, named Meisjes met baarden existed of several dresses attached to the models’ faces by a small wire or threads, like a beard. The idea was fun, yet it made the actual clothes fade into the background. 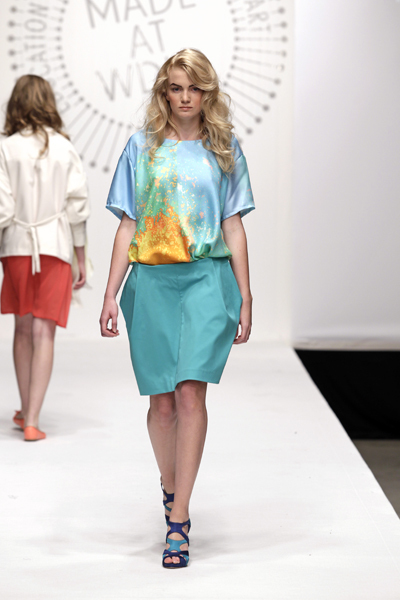 The last collection we would like to mention was Zoot me if you can, by Mandy Minkman. Not only were her men’s clothes very well-made, we loved the whole concept behind it too. 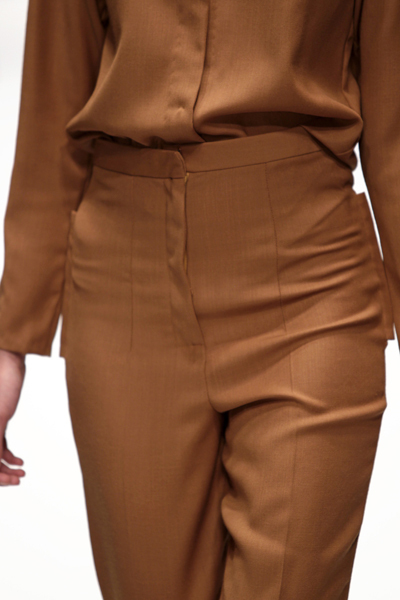 Mandy was inspired by the Zoot-suit from the late 30’s, mostly worn by jazz-musicians. This was visible through the great pants she designed with outstanding proportions.